“We are not as modern as we like to think we are” (dustjacket flap, Organic Design in Home Furnishings, ed. Eliot F. Noyes, exhibition catalogue (New York: Museum of Modern Art, 1941). 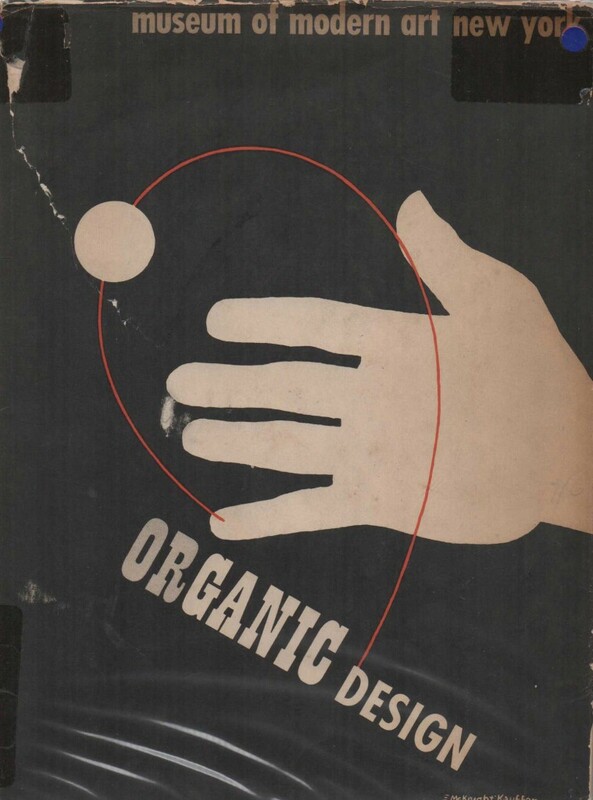 This quote, taken from the dustjacket of the exhibition catalogue, Organic Design in Home Furnishings, 1941, goes on to say: “Most of the out-dated and standardized furniture which still frames our lives is no longer satisfactory to our esthetic sense or even valid for practical needs”. 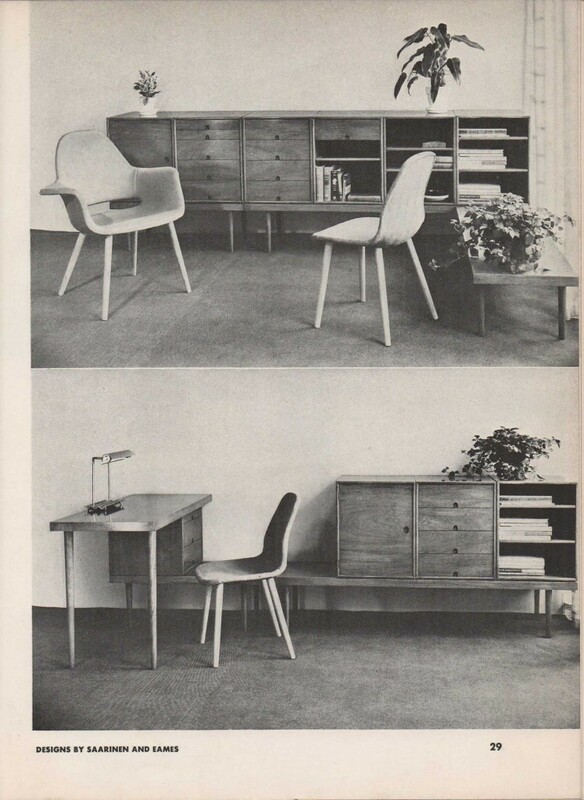 The catalogue was produced for an exhibition on furniture and home furnishings held at the Museum of Modern Art in New York in 1941. It illustrates the winners, designs submitted, finished products and some of the steps in the manufacturing process. Eero Saarinen and Charles Eames won two categories of the competition – Category A ‘Seating for a living room’, and Category B ‘other furniture for a living room’. The competition was held by the Department of Industrial Design, MOMA, in 1940: it was open to designers in the US and 20 Latin American countries. The purpose was to discover a group of designers who could come up with designs that were relevant to the present day, by contributing ‘to the creation of a useful and beautiful environment for today’s living’. 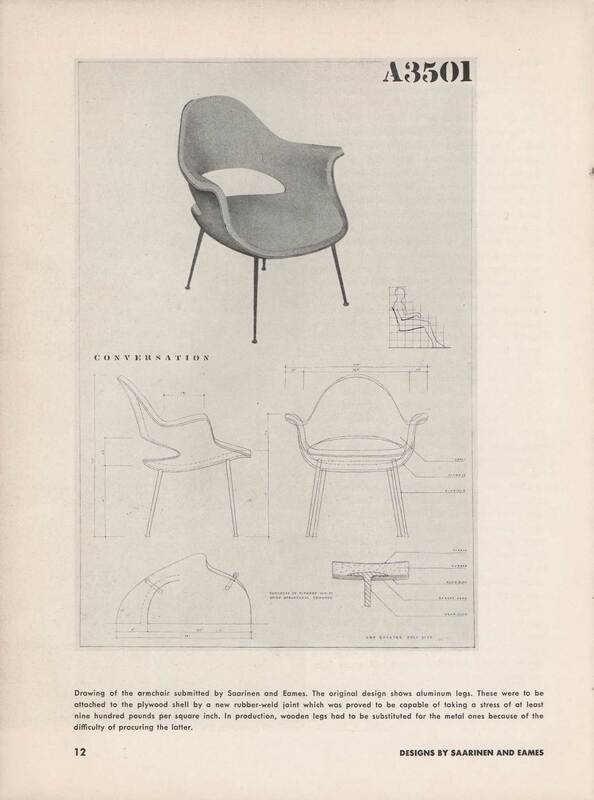 The competition was part of MOMA’s aim to support cooperative working between designers, manufacturers, and dealers. The competition was sponsored by 12 American department stores, who offered contracts with manufacturers as prizes. 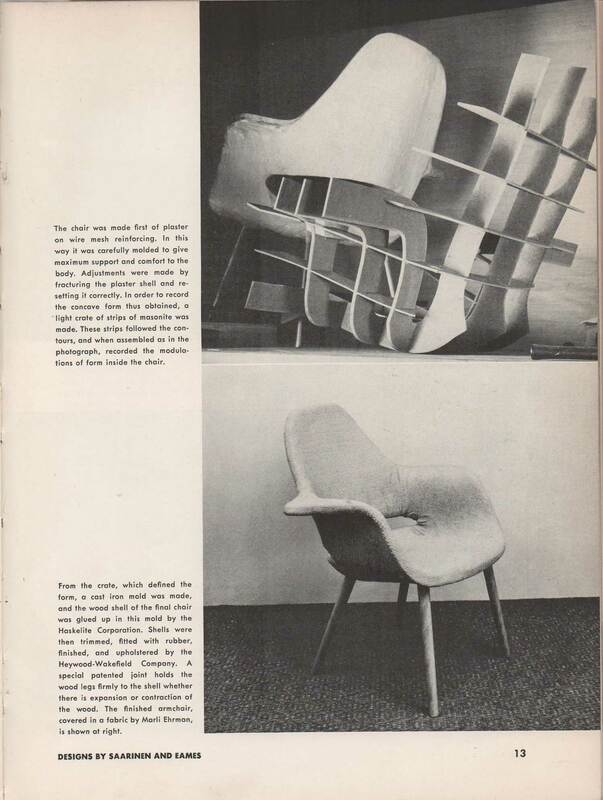 The catalogue illustrates several chairs designed by Eero Saarinen and Charles Eames made using plywood shells (Charles and Ray Eames had started developing three-dimensional moulding of plywood in their apartment (!) in Los Angeles from July 1941; before the exhibition opened, several chairs and armchairs were made). Apparently wooden legs had to be substituted for aluminium ones due to the scarcity of aluminium during the war. A prototype was made by the Haskelite Corporation, with Heywood-Wakefield, but due to war it never went into production. The cover and jacket design of the catalogue is by Edward McKnight Kauffer, the Anglo-American graphic designer. The AA Library copy of the catalogue was presented by Douglas and Margaret Stirling Craig in 2006; it has Margaret Stirling Craig’s signature on the first page.